You are here: Home / RV Basics / Can Your RV Propane System Explode & Kill You On The Road? But ask any RVer if they bother to shut off the RV refrigerator on the highway and they’ll most likely say “Never.” The reality is that modern RV propane systems are safe compared to yesteryear’s models. But the risk of an explosion is still there. Despite warnings from propane safety experts, most RVers leave their system on while in transit. “I gotta have ice for Happy Hour so I run the fridge,” says iRV2 member Polyian. Can your RV propane system explode on the highway? Old-Biscuit also chimed in about the risk factor in leaving your system on. “Circuit boards have ‘safety’ requirements that must be meet prior to allowing gas valves to operate (DC Voltage thru t-stats, thermal fuses, sail switches, limit switches etc.) RV propane system is a very safe system and if not safe to use while in transit I would not want to use it while sleeping,” he explains. However as this RV propane tank explosion shows, accidents happen. This RV caught fire at the gas station. It may or may not be the result of a propane tank explosion. But if this RV driver left the propane system on, they’re not alone. Unfortunately sometimes accidents can turn into disasters when the refrigerator is left on at a filling station. For example, in a Houma Louisiana gas station explosion incident, a couple’s RoadTrek caught fire at the pump. The RV propane system explosion happened when “the nozzle spewed gasoline, igniting when it came into contact with a pilot light on the RV,” wrote the local newspaper. The couple, their dog and everyone at the gas station barely escaped with their life. Each RVer must decide if leaving the refrigerator on while driving is worth the risk. Currently there are no laws mandating RVers to keep propane off while in transit (except at gas stations and in tunnels). Regardless, Escapees RV Club’s safety expert Jim Koca suggests driving with it off. Many RVers worry about the food in their refrigerator staying cold if propane is left off while traveling. But to that, Koca says there’s an easy workaround: blue ice. For RVers who prefer to play it safe, they can take comfort in knowing that the relatively low cost of a few bricks of blue ice may just save their home and their life. While on the road one day in our 2006 Fleetwood Bounder the right inside rear dual tire blew out. I looked in the mirror to see the vehicles behind us dodging the contents of both the compartments in front of and behind the wheel well because the tire was shredding the compartments. We found a place to pull over and waited for our Emergency Road Service to arrive to change the tire. While waiting we decided to make lunch and tried lighting the stove to no avail. I discovered that I had forgotten to open the propane tank valve after I had had it topped off for the trip. When I opened the valve I cold hear a hissing noise coming from the damaged wheel well. Upon investigation I discovered that the propane plumbing that ran inside the damaged wheel well was ripped out as well. I shudder thinking of what could have happened during the tire blow out if the valve had been opened. Needless to say I had the plumbing re-routed but still to this day travel with the propane valve off. The contents in the fridge will keep as long as the door opening is kept to a minimum. Wooooaaah. Thank you for sharing that story Anthony, I’m glad you guys were safe. Nobody ever thinks something like this can happen to them but you are living proof that it can. I always shut my tanks off before pulling out, I just make it part of my pre-trip. I always shut off the propane before hauling. Thank you for your very important lesson here. I had a blowout coming home last time and haven’t checked the propane line. I will do so before heading out again. While others are saying this article is alarmist, I wholly disagree and your experience is a lesson for anyone smart enough to listen. If there was a hissing sound, your propane was not shut off. Only the electrical system was shut off if the master key was off. Read the post again Nick….. it was shut off and he was turning it back on………. We are going out in our new RV this December, I am grateful I ran into this article and video. My fridge will be off while traveling and the propane as well. Lesson learned the easy way and someone else’s huge misfortune. Anthony Sanchez – Nothing would have happened. The fact is, your propane tank has a safety valve that closes if a line bursts. Its required by law. It sense a sudden change in flow and closes down. It is the first thing after your manual valve. Paranoia is caused by those who do not understand their systems and how they work. Traveling down the road with your propane on is no less safe than running your motorhome on gasoline. Since your fuel pump is in the tank, your fuel line is running at about 45 psi – much greater than propane pressure. Gasoline has a lower flash point, and contains more energy than propane. I will agree with the potential hazard for flame at the pump. Especially with older RVs. Gas fumes can travel to open flames in the water heater or the fridge, or the furnace. While it is unlikely, that is the one possibility that does still exist. Good designs put the fuel fill on the opposite side from the propane systems. This is a good barrier and reduces the likelihood of a disaster. Really? Why didn’t it shut off when I opened the valve then? Because you opened it slowly. The sense valve senses a sudden release. If you opened the valve quickly, your safety valve would have closed shut. Try it sometime. Turn on your stove and light it. Close the main tank valve. let all the propane bleed off. Then open the valve on your tank really fast. If you open it fast enough, you will hear a clunk as the safety valve closes. I have done this in my previous motorhome. My propane tank was completely empty. The guy who filled the propane tank shut the tank valve off. When he opened it, he opened it too quickly and the safety valve closed. He heard it clunk. he told me to open the valve on my stove and listen and smell for propane. There was nothing. He then closed the valve and opened it again. My safety valve was very sensitive, so it took him 3 tries to get the valve to stay open, so my propane system would work. Well – you were not there! If sudden damage would only let that amount that I witnessed to start escaping the danger is real. When I opened the valve I could not only hear it escaping from about 15 – 18 feet away but when I went to the wheel well I could strongly smell it. After turning it off again and giving it enough time to clear I asked my wife to turn it back on slowly while I investigated it and quickly found the damage. Now I’m wondering if the safety valve is operating as it should. I’ll try your suggestion and move on from there. Article is waste of time, total speculation with no facts about LP gas safety systems in today’s RVs. Agree with Rick…..scare tactics. It’s possible that you could trip and the pen in your pocket could stab you – we all better stop carrying pens. I travel with my fridge on propane all the and have never had or heard of an issue. I leave it running when I stop for fuel. Can’t agree more. This is an example of irresponsible fear mongering. The fire at the station involved the front of the coach not the fridge running while being filled. I have yet to see ONE example of a fridge igniting while running in camp or on the road OR EVEN while filling at a gas station. If this were a real threat wouldn’t you think that every manufacturer out there would suggest that you turn off the propane while traveling? Nope, not a single one but that doesn’t stop the “experts” from telling everyone to do just that. Amazing. When I purchased my RV trailer a couple of weeks ago, the salesman said never travel with the propane valve turned on. The reason is because an accident can result in a severed propane line. If there’s a spark too, then it can cause a serious inferno. I wholeheartedly agree. So many (including some fire departments know so little about propane. Far, far, far safer than gasoline and you’ll let your kid mow the lawn or blow the snow with gas. Such a pretty judgmental comment. Just because no incidents to justify that disaster can happen doesn’t mean it wouldn’t happen. Pure speculation is why we carry insurance. The RV industry is largely unregulated sector of the motoring public. Some RV owners take it upon themselves by making changes that in some way don’t even meet DOT mandates (not approved LED signal light etc.). Running wires in heat exhaust ducts, miswired high current battery powered loads. . .and of course pulling into gas pumps with pilot light on. Some localities even prohibit climbing back inside the car after pump has started dispensing due to arcing static. There had been disastrous fires caused by this. . .and well documented. If static spark can cause fire how much more or less can a pilot light be capable of. Look, you are off topic here. The original point was that leaving your fridge running is going to cause a catastrophe. We are not going to talk about owners mucking with their RVs in an irresponsible manner nor was this a question about static discharge. 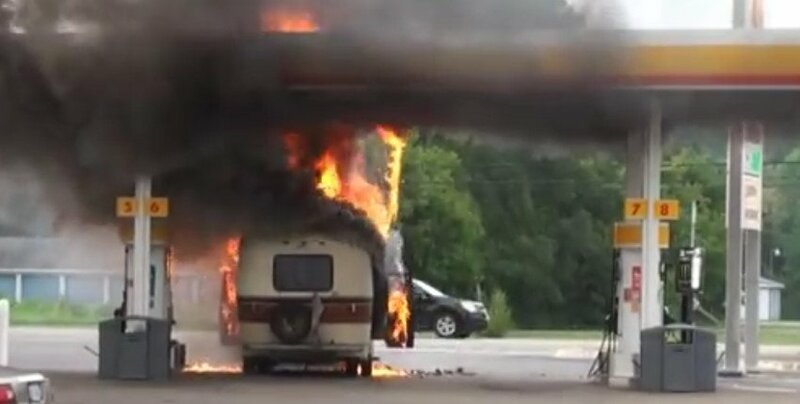 Yes, there have been documented cases of static causing fires but they are not unique to an RV with a fridge running. It is true that many things “can” happen so why take a chance? Well consider the half full gas tank sitting below your family. One spark and this thing will go off like a bomb. This “can” happen so why do you continue to drive? After the Ford Pinto was removed, exploding gas tanks just don’t happen. And, I will say again, show me one case where a running fridge caused a fire and I might change my mind. If you choose to spend tens of thousands of dollars for an RV and like the idea of packing ice into your fridge for a long trip then that is up to you. If this was a real threat than every single manufacturer would issue a warning. They don’t because this is not a real threat. Thank you for this article, which I do NOT consider a waste of time! I just bought my first RV. It has solar panels which can handle everything but the microwave and AC. Would this power the fridge while driving, or would it only work with the propane? You did not mention the wattage output of your solar panels. It may be able to run small devices like laptop and charger along with small kitchen appliances like electric carving tool and can opener but not a toaster. Most absorption type fridge will draw at least 300 watts. Given that power draw you can figure out if you have that much power to run the fridge. Your solar panels are basically there for charging your batteries. The coach battery can operate a fridge via an inverter whether you are camped or on the road. And yes it will work on propane. . .but check your manual. Even though you are running propane you will still need battery power for fridge control. Argon 6, thanks for responding. I think it’s 3-way (I haven’t brought the RV home yet). I was just wondering whether the fridge could run while driving on only the battery draw. I think the panels total 200. The sellers said they could boondock for a week with them, not using the toaster or microwave and probably running the fridge on propane. Why on earth do the North American RV companies not make the fridge 3-way power (12 volt, 100 volt and propane) as is the case in Europe and Australia? There, when you have pulled into a rest stop or gas station and it has been on 12 Volt, it can set to switche to propane — if you want it to do so. You can easily control this so that propane only comes on when you want it. Simple answer. Adding the 12 volt option would increase the cost of each unit. They have proven to be problematic over time as they can draw down the batteries greatly. The other reason is that today’s technology has made the standard 110V/propane units extremely efficient and safe. Yes, safe. As briefly mentioned above, they do. Smaller refrigerators are routinely available in 3-way form, and that’s commonly the version chosen by RV manufacturers. Larger refrigerators typically don’t have 12 volt DC operation, probably because they require too much power – in a trailer with limited power available while towing, the 10 amps or more is seen as too much. Our 2000 BigFoot 22-footer has a large fridge, which is factory-rigged to run on electricity while the towing vehicle is on. When the towing vehicle is turned off, it switches to propane, and attempts to light up for 5 seconds (if the setting is on “Automatic”). I can see how the large electrical arc (about 1/2 inch long) could be enough to light up fuel fumes when someone is filling up the car/truck, for instance. I was always a bit concerned with that arc. Not the propane itself; that is extremely safe, but the electrical arc necessary to light the propane for the fridge could represent a risk. So I added a battery and controller, connected to a 300 watt solar panel, The fridge “doesn’t see” that the car is no longer running and the fridge keeps working on electricity off the battery, until the solar panel controller indicates a battery that is at 40% capacity. At that point, the controller cuts the current from the battery to the fridge, which then switches to propane with the large “arc of death” coming on. The standard deep charge battery gives me a couple of hours of fridge electrical power. It recharges rapidly thanks to the truck and solar panel, and the electrical-power time I get is enough to fill up the truck safely. As a precaution, I still turn my propane thanks off while driving around; my fridge is running on truck electricity, and I certainly will not try to fit blue ice packs into the fridge: that would involve me messing with my wife’s fridge packing… it would be safer to sit on a propane tank while having a smoke at the gas station! They used to commonly make three-way but most now are two-way. When running fridge on battery we always turned it off when stopping for very long because of the draw on the battery. Batteries are different now and with solar maybe not such an issue as way back then. What is the point of this article? The one incident mentioned talks about the RV being doused with fuel, causing a fire. If you over heat a propane tank it WILL explode, but that can be said of almost any pressurized cylinder. All European fixed propane tanks have a overpressure relief valve, which ends in a pipe running down to underneath the vehicle. Plus a shut-off valve which prevents the tank being filled over 80 %. I cannot imagine North-American propane installations don’t have at least similar safety measures. Yes, both fixed and portable tanks have pressure relief. The valve which prevents overfilling in a portable cylinder is the Overfill Prevention Device (OPD), which is a secondary safety feature, not the primary method of controlling the fill. Fixed tanks routinely have a Stop-Fill device, which is a better version of the same thing, and is intended to be used to shut off the filling. So, for fixed tanks the situation is identical. – the one, meant to fill yourself with LPG, containing the 80% OPD you mention. – the one, meant to be exchanged for a full one when empty. No OPD! However, some gas depots fill the last category as well. If they do it well, they put the tank on a scale (each tank has the empty weight, volume, max. pressure, production date etc. stamped in. So far, so good. But…. any DIY artist who wants to save some cash (on propulsion gas there is less tax than on camping gas) can easily make an adapter with part from the hobby shop. Or convert a car tank (liquid gas) to a cooking and heating tank by turning it upside down. That’s where some nasty accidents have happened, overfilling and than parking in the sunshine….. Many tanks also have a leak shutoff, which is a sliding check valve that will close if the flow is lager than normal usage, like an accident which breaks a line. These have been around 18 years I know of. Not many BUT all have an excess flow check valve as mandated by law. All vehicles powered by propane have the same safety device. This article is nothing but fearmongering clickbait. Propane tanks do not explode as the fuel/oxygen ration is not correct to allow the burn, it only fireballs when leaking. As Geo explained, the excess flow valve is now standard… but it’s not in the tank valve assembly, it’s in the fitting on the end of the hose which is screwed onto the tank. When we traded in our old travel trailer for a large 5th wheel, 5 years ago, we asked the sales manager, an experienced RVer his opinion on leaving the gas on while traveling. We used to leave the gas on most of the time on the old unit. His reply, “What will you tell the insurance company if there is a fire? And besides, the fridge will stay cold for the day.” True, the fridge does stay cold for the day. Here in British Columbia, if a towed unit is over 10,000 lbs, and ours loaded is 14,000 lbs, a separate endorsement is required on a drivers license. Part of the road test and pre-trip check for getting this “Endorsement 07” is shutting off the gas, among many other common sense things. Also, we travel on BC Ferries when we leave Vancouver Island, usually on our way to Arizona, and the gas is REQUIRED to be shut off and tagged, while on the ferry. I realize most people do leave the gas on, and that the new fridges have good safety systems, BUT. Anyway, we always shut our gas off. It has become a habit, and the all important Happy-Hour ice is still good when we set up somewhere for the night! Agree completely with John Rodall’s post. We took a three day seminar ten years ago. A Canadian fire marshall discussed this subject and noted that the propane lines can easily rupture in an accident and then you have a highly volatile, if not explosive heavier than air gas, spreading about looking for a spark. I was so impressed by his exposition that I asked Elaine to attend his lecture (we had split up to take in as many lectures as possible). The fire marshall noted that turning the fridge down to maximum cold will permit food to stay cold for ten hours. He suggested turning on the fridge at stops to maintain cold. The post of 6 August is misguided. Propane is a heavier than air gas that will seep along the ground looking for a spark as noted above. This spark could be many feet away. Gasoline is a liquid that will puddle and spread but will not result in a fuel-air bomb explosion as can propane. Our tow vehicle is diesel so that problem is even less. We have been full-timing for 10 years and are primarily boondockers: Alaska, Labrador/Newfoundland, Baja, Florida, Yucatan. Turning off the propane is prominent on our check list. We do have a 1 kW generator with the 5th wheel but it is only run for 30 minutes every month as manual suggests. The Roadtrek has a 2.5 kW generator and we have had to use this when we were in San Cristobal de las Casas in Chiapas since it was overcast and we were under trees. Both of our RVs are set to run everything off the battery suites. If we ever did need shore power, it goes to battery suites via a 15 amp (120 V) extension cord (we tossed the 50 amp cord years ago) and battery chargers. Line power in Mexico (and often in US) can vary greatly in voltage. We burned out micro-waves in Baja in Yucatan before doing this. This is incorrect. Gasoline is a highly volatile liquid; pour it on the ground and you very quickly have a vapour cloud which a real explosion hazard. Diesel fuel is much less volatile, and so is much safer in this respect… and yet, almost no one suggests that gasoline-fueled vehicles should not be allowed to operate on the road, and that we should all drive diesels instead. It seems to me that just because nothing has happened to some of the responders of this article that nothing will ever happen to anyone regarding propane safety. I would wager that there are more propane related incidents that others have experienced. Perhaps in time some of those incidents will be posted. Tony, your last statement is spot on but I will venture to guess that “those incidents” are very few and far between. In today’s social media world a propane incident of the catastrophic variety would surely be published. We all take risks. We weigh that risk against the probability that something “might” happen. The sheer act of driving down the road creates lots of risks and you don’t have to look far to see documented stories about families dying in horrific crashes and yet we all head out every day. Gasoline related fires far outnumber propane fires and yet we still drive our gas vehicles. We pick and choose risks that we willingly take, often ignoring those of high probability to choose on those with very very low probability. Until you can offer up some real numbers of issues caused by using your fridge while on the road I will continue to put this risk in the very low category. Pick your poison as someone might say. We have a 4-litre water jug in the freezer overnight before setting out on a trip. When we leave in the morning, I isolate the propane and take the water jug which is a frozen block from the freezer and put it in the fridge. After a 10-hour trip, the fridge is still less that 6°C. Ricky I totally agree. I always run with my fridge on propane. And DR, you fridge is 3 degrees too warm for safe food storage so there’s another “risk” – food poisoning. Reading these opinions as to what is safe and what isn’t prompts me to ask another question about safety. .Operate a vehicle containing hazardous materials. (RV’s would fall under this rule). .Test for and obtain a commercial learner’s permit (CLP). .Hold your CLP for a minimum of 14 days. .Take the road skills test for your commercial driver’s license (CDL). With that being said, there are thousands of RV drivers out there that have no special training in operating/driving large RV’s. (some RV’rs are over 75-80 yrs. old) That being said, should you be required to pass the Federal/State regulations if driving and or towing an RV with a total length of RV or RV and towing vehicle over a given length? I’m not advocating that RV’rs be required to obtain a CDL’s (i’m 74 and believe I am more than qualified as most RV’rs do) but since were talking about what is safe, is it a safe practice or not.? I agree with you. Many drivers are naturals and can handle most vehicles. However, many more can’t handle an SUV. Therefore, I do believe and have advocated a special license or endorsement to operate rv’s other than a camper van or pickup mount camper when the rv’s length exceeds 14 feet, and for all towed rv’s over 10 feet. I have seen many rv-er’s who have no idea how to handle large vehicles in towing, parking, turning and even stopping. I do not understand the reluctance to such a license if you can handle your rig. It seems a no brainer that someone who has never operated any vehicle bigger than a Honda Civic should be required to prove their ability to operate a towed rv or a forty foot bus. Most drivers do not even use car mirrors properly and in any rv the use of mirrors is imperative. Seriously? The top three selling models of vehicle in North America are the three big brands of full-sized pickup trucks (Ford F-150, GM Silverado/Sierra, Ram 1500). Every one of those things – even in the shortest version – is much more than 14 feet long. Even a Toyota Camry is 16 feet long. It’s hard to find a car under 14 feet long, and there’s certainly no motorhome, camper van, or truck and camper that short. For that matter, there are travel trailers for sale which are under 10 feet overall length. I get the idea of ensuring that people are qualified to operate vehicles of unusual size, but a reasonable size threshold would need to be set. 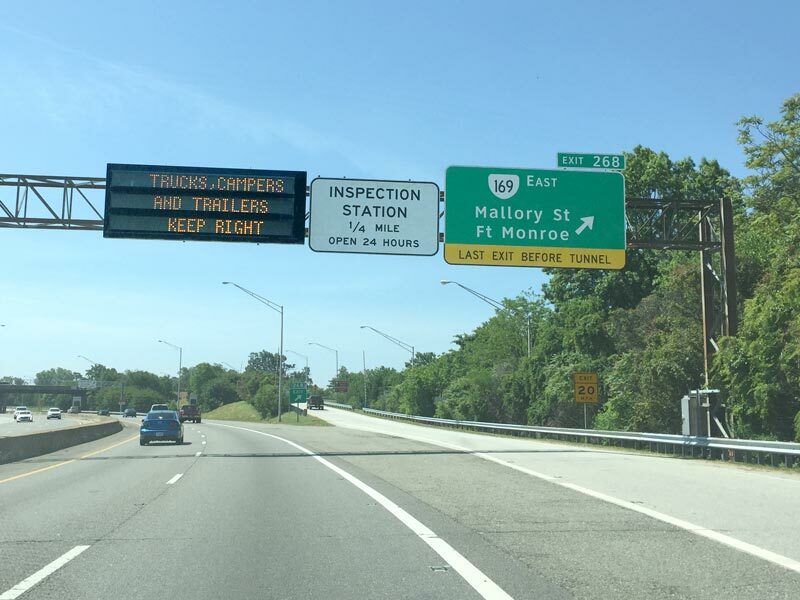 Simply removing the exemptions for RVs would catch the most problematic cases, which are the huge motorhomes which would require a truck driver’s license (not a CDL) due to their size if not exempted as RVs. In driving there is not much difference between a 40′ bus and a 40′ motorhome. That doesn’t look much different from here. A big sedan or SUV or personal-use van – or a motorhome – is a “car”… the 3500 kg limit is for a “goods vehicle”, which means a commercial vehicle. It’s the same as ten-ton motorhomes being driven here with a normal license, even though a much smaller van would require a truck license if used commercially. Also, 3500 kg GVWR is much heftier than a 15-foot-long car. The proposed 14-foot length limit is just unreasonable. I agree that a driving a 40′ bus would not be different from driving my motorhome. If you think they should have the same licensing, you only need to remove the RV exemption, not create a new size limit. in Europe it is only the weight (or the number of passengers) which decides the license the driver needs, and NOT the size or the use of the vehicle. Not true, according to the list which you provided, and as I already explained, “cars” and “goods vehicles” are separately regulated. A car (with up to 8 passengers) can be any weight according to that list, while only other types have a different license over 3500 kg.. A big Euro sedan can be over 3500 kg GVWR; are you really suggesting that S-Class Mercedes drivers have different licenses? No, not likely. > Not true, according to the list which you provided, and as I already explained, “cars” and “goods vehicles” are separately regulated. We were talking about RVs, i.e. “cars”. In Europe the weight limit goes also for a car. This determines the license one needs. > A car (with up to 8 passengers) can be any weight according to that list, while only other types have a different license over 3500 kg..
No, A passenger car over 3500 kg (e.g. a motorhome) requires a license class C.
> A big Euro sedan can be over 3500 kg GVWR; are you really suggesting that S-Class Mercedes drivers have different licenses? I have not seen “normal” cars over 3500 kg yet. The mass of a S-Class Merc is 1875 kg. That’s a curb weight, not a gross weight… and an S-class is typically not quite that light (1875 kg), even empty. But you’re right – the gross vehicle weight of S-Class sedans (from the Mercedes UK site) is only 2690 to 2750 kg. You would need a minivan to get up to 3500 kg GVW. Apparently US editions of the same cars are much heavier than European versions. The 1875 kg comes from a Wiki page with (German) MB specifications. But there are different types (Baureihen) within the S-class, the 116, 126, 140, 220, 221 and 222. I still say it’s being over dramatic and unnecessary fear mongering. The only thing you have to fear is the 70-80 year old’s NOT ALL OF THEM but the ones that have no business driving a car let alone an RV. That includes these youngsters that think they’re all that and bag of chips and try to show off the new lifted truck and the longest Toyhauler they can find to make up for their short comings and they can’t afford. Turning off your propane is good safe practice and don’t let anyone else tell you different. “Turning off your propane is good safe practice and don’t let anyone else tell you different”. Well said, and it puts a lot of sense on those overwhelming nonsense based on their argument that lunch trucks and RVers with fridge and probably cooking dinner while on the road. Get real and wait till you reach your campsite and turn your propane on. . . you can save yourself trouble and others should the unthinkable happens. Coincidentally, we just returned from a trip down south to see the eclipse. When driving through some construction in Pennsylvania, our propane system sprung a leak at the pressure reducing valve near one of the tanks. Fortunately, I had the propane valved out and it was only discovered when setting up that evening. Please turn off the propane when travelling! In Australia and France it is illegal to drive with LPG-equipment on! And many campers use a pressure regulator with crash sensor. That’s interesting – I had not heard of the Euro crash shut-off systems before. The closest thing here is the excess flow valve: if a hose ruptures or a fitting is broken (such as in a crash), the flow rate spikes up very high, and that triggers the excess flow valve to choke off the flow. Every modern RV (and grill) hose to connect to a cylinder (tank) has an excess flow in the fitting which screws onto the tank. Also from the Truma site: the Euro equipment includes their version of the excess flow valve, which Truma refers to as integrated hose rupture protection. I don’t know what you mean by “valved out”. Does that mean you had the valve turned off? If so how did you know it was leaking? The new OPD devices have two built in safety features. If there is a fire at the tank the tank will shut off. If there is a break in the line somewhere the excessive flow safety guard will turn off the propane. This feature is why you need to open your valve slowly when you turn it on. So, that leaves the spark at the fridge as the only viable culprit in starting a fire at a gas station. We can talk about the volatility of gasoline vs propane, the rate of evaporation of spilled gasoline, the air/fuel concentration required for ignition, the heat required for ignition and so on. But, given all the variables, Australia does not have a superior system to ours. The U.S. is the single most litigious nation in the world. Would we manufacture dangerous tanks and suggest that trailer owners use their refrigerators as designed? Think about that for a minute. It seems reasonable to assume that D R meant that the tank valves were shut off during travel, the leak was at the regulator, and the leak was discovered only when a tank valve was opened after stopping. Yes, it would have leaked during travel if this were the case… but it would not have had a fire (let alone an explosion) in that case, because the propane would have been dispersed in motion. I don’t see a situation of much concern here. I am a 66 year old Canadian and have been around RV all my adult life and have never heard the phrase valve in or out. I don’t know about it being a Canadian term but as a Copper Miner in AZ we’ve always used that term with it meaning cutting off flow or “Valving Out” a line carrying stored energy whether it’s a gas or fluid…..
Next you are going to tell me I shouldn’t smoke crack while driving an RV. No, I don’t smoke crack but this is fear mongering. After our 2 year old Dometic propane fridge caught fire we changed it out with a Norcold DE-EV0061 AC/DC fridge. We put 2 100 watt solar panels on the roof of the trailer. The solar panels keep the 2 AGM batteries up while on the road. The fridge only requires about 50 watts to operate. Also it uses a compressor instead of the absorption technology of propane fridges. We have run it all night on DC and still had over 59% charge left in the batteries. This fridge will cool down in 1 hour vs several hours for the propane model thanks to the compressor. This is always a debate I see. Page 37 in my Argosy Manual states that it is illegal to travel with the tanks on in some states. I have seen people get really irate at this statement which I do not understand the anger. I asked around and really it comes down to nobody knows if there is a law and really no one will enforce it. I am fine with taking the extra precautions. Understand a pin hole leak in a gas line will not shut off the valve. My brother dropped a gas tank while driving and it wore a hole in it and sparked and did not blow up as people think. Remember there is also a vapor canister on the tank so the vapor theory is not a issue accordingly. If “nobody knows if there is a law”, then there obviously isn’t one. Ask a law enforcement officer: if they don’t know of one, then there obviously isn’t one, at least one which is enforced. There is a common myth that tank valves must be closed in Canada, and it is even spread by some safety organizations. They usually quote a federal regulation, but anyone who actually reads that regulation can see that it clearly and explicitly exempts the tanks of an RV. Rather than propagating the myth, why not deal with facts? I run my refrigerator on 120 ac when on the road. I have an inverter in the truck which provides the ac. It is safe, and works very well. The current is drawn from the battery and the alternator covers the charge. After reading the comments I find them all interesting. Something I was told years ago about refrigerator operation and gas stations is, to shut off the refrigerator when refueling. The big concern stemmed from the gasoline fumes around the pumps and the pilot or the igniter of the refrigerator igniting the fumes. I used to shut off the refrigerator before pulling up to the pumps but haven’t done that in a long time. I own a motor home. I felt it my due diligence to learn of laws pertaining to driving one of these. Y’all especially the person that wrote the article and apparently some of you others…. but there is a law in TEXAS that states the PROPANE TANK IS TO BE TURNED OFF WHEN YOU PULL INTO A GAS STATION…!!! Is there really? Can you provide the name of the law? (what section of what regulation?) It seems more likely that you might be required by some regulation to turn off propane-fuelled appliances, rather than to close the supply valve. Many people insist that specific laws exist, but are unable to back it up with facts. They are often misled by other people, or by non-authoritative information sources, or if they actually read the regulations they misread them. I have read through this entire blog regarding a propane refrigerator and there is good reason to be concerned for safety sake. I do think that there is a bit of over reaction to the comments, a lot of myths stated, and l that as stated be some others fear mongering. I can’t tell you there is a law to turn your tanks off in an RV in motion or when fueling. All of the newer equipment built in the past 20 years or more have safety equipment to prevent the appliance from starting fires not that they don’t fail (Norcold refrigerator RV fires, refrigerator would catch on fire for being setup out of level.) Common sense tells me it is good practice to turn off all pilot lights and ignition systems for your appliances when at a gasoline pump fueling. I have been RVing for over 45 years, I have always drove with my refrigerator running on propane and made the habit of shutting it down at the gas station before fueling. May or may not be correct, this is your choice of how you operate your equipment. Truly if there is is one appliance you should not have running when on the road it is your propane hot water heater, they are way more dangerous than your refrigerator and have caused as many if not more fires. ( I had a gas valve on one catch on fire when I was away from the RV once when hunting, fortunately the plastic on the valve melted and shut the valve off.). I don’t think propane is any more of a problem than the gasoline tank in gasoline powered vehicles, it is the flame created by the pilot burner of the appliance. If you are fueling simply turn the appliance off to prevent the fumes from the gasoline from igniting. Rare chance of this happening unless your appliance is near where someone is fueling or the station vent pipes. (The fuel tank vent pipes are usually up above the canopy where most do not know they exist.) If you have ever pulled into a propane gas company to have your tanks filled the attendant will tell you to turn off all appliances before he fuels your system just as when you go to a gas station there are signs all over the station that states to turn off your vehicle before pumping gasoline. Off track a bit but never fill your gasoline cans setting in the bed of your truck, put them on the ground when fueling. Static electricity created with no ground while filling will ignite the fumes. There has been a lot of off track commentary so I will had mine regarding CDL’s “Commercial Drivers License”. Someone stated that you should have to have a truck drivers license not a CDL to drive a motorhome this is one in the same. This is what all commercial drivers are supposed to have to drive a commercial vehicle. They come in several classifications. The two most used are class A (pulling a trailer rated to carry 10,001 lbs or more) class B ( a motor vehicle with a GVW rated at 26,001 lbs or more, legal to tow a trailer not rated to carry more than 10,000 lbs. There is a class C for 26,000 lbs and under, air brake endorsements, bus endorsements (for carrying passengers), hazardous materials endorsements, doubles and triples endorsements, and do on. I have a Class A for my business purposes and have driven trucks and pulled trailers all my life, my RV is a Class A coach and I pull a trailer because I don’t like to flat tow. That said do I think there should be some type of RV license requirements, yes I do if only to be sure the drivers are qualified. I will stop here because I am way off track to the origin of this post. good logical points! learned a lot! not a pro RV-er here, thus have a question: aren’t there RV fridges that work with both propane as well as electricity (and at times a third power source as well) which can switch between power sources AUTOMATICALLY when the car starts or stops, or anything along these lines? after all, we’re living in an age of SMART self-driving cars and Alexa or Cortana doing things for us by a mere voice command, aren’t we? My 2006 Bounder has an “Auto Mode”…. it will run off propane but as soon as it detects an sufficient electrical power source it will switch over to it. I run my propane fridge while traveling. When stopping for fuel I stop short of the pumps and turn off the fridge. Restart after I leave the pump island. I feel sorry for the poor Avion Motorhome, Strange but the fire seems to be burning from the engine compartment rather than the propane system. Just maybe a nearly 40-year-old Dodge engine with a leaky fuel line or a leaking carburetor might be the cause rather than a propane refrigerator. Why would they save the propane section and let the engine continue to burn.. Very few motorhomes have propane in the engine compartment. Gas leaking all over the engine should be avoided in any vehicle., That is a well-known cause for fire!